In just one cubic metre of air, there are millions of particles potentially harmful to your machines and equipments. These are primarily made up of dust, bacteria, viruses, smoke, fumes, hydrocarbons, water, oil and other contaminants derived from human and industrial activities. When this air is sucked into your compressor and compressed to 8 bar pressure, for instance, the concentration of particles will increase by eight times. 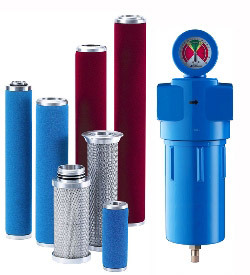 of your pneumatic machine or adversely affect the quality of your end products. This is why it makes economical sense to incorporate compressed air treatment into your compressed air system as the benefits would outweigh the cost. The cost would be only a small fraction of your total business investment. Clean, dry air protects the air system, reduces maintenance cost and increases finished product yields.